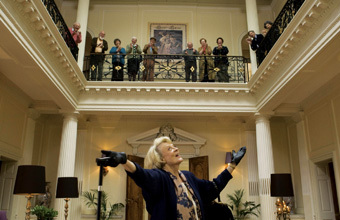 BUCKINGHAMSHIRE mansion Hedsor House has graced the silver screen as the backdrop for hit film Quartet, starring Dame Maggie Smith. The story - based on Sir Ronald Harwood's stage play of the same name - was filmed exclusively on the picturesque, historic 85-acre country estate in autumn 2011, featuring an all star cast. Chosen by the film's producers and location scouts for its character and charm, the 18th Century home of Augusta the Princess of Wales, mother of King George III, was transformed into Quartet's fictional Beecham House â€" a stately retirement home for opera singers.